I have enjoyed some luck with used book stores and cook books that were sold to housewives for a fundraiser 40 years back. 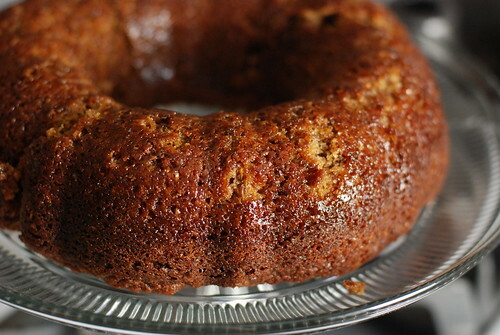 People share treasured family recipes that often turn out great (or are at least interesting enough to try to modify). However, for the record, I’d like to advise all of you against spending $5 on this ditto-machined little avocado number. 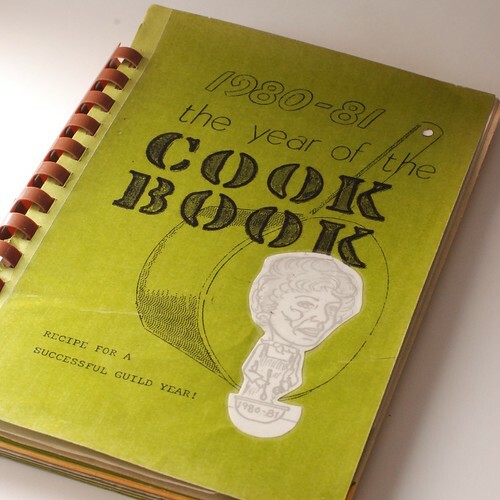 I think that’s supposed to be Julia Child contact-papered to the cover there. Also, there were foil stars, one can only assume for extra pizazz, and a recipe for something awful titled Deviled Eggs Supreme that calls for cream of celery soup. Here’s where the trouble started. I thought for sure I could coax this cake into being an acceptable vehicle for the several pounds of spent grain in my freezer. For the uninitiated, that there is a byproduct of brewing beer, and since it seems like everyone we know is a homebrewer, it’s plentiful and free around here. 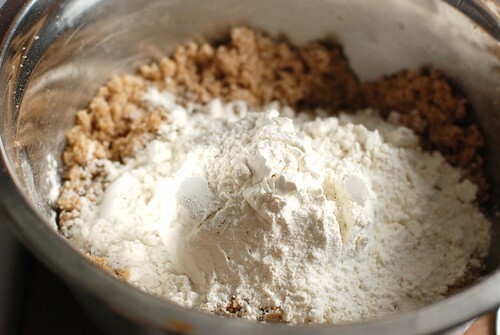 Spent grain is an all-natural high-fiber cereal, neutral in flavour, but similar in texture to cooked rice or oatmeal. You see why it might just work. Once upon a time I posted a recipe for spent grain cookies, but harvette did a much better job of the recipe by excluding peanut butter. I took a picture of oatmeal too. 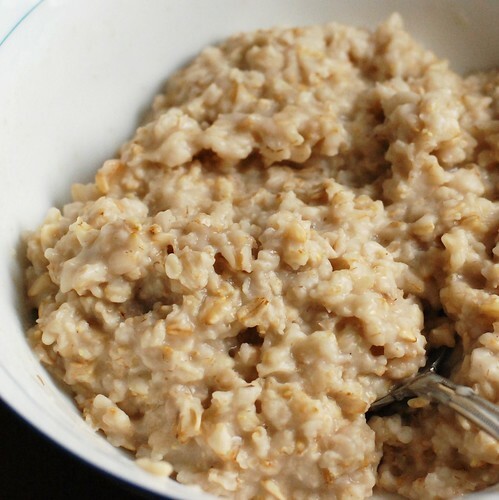 I have no good reason for sharing that other than it is a particularly nice picture of oatmeal, wouldn’t you agree? So anyway, I made two cakes tonight, one oatmeal, one with spent grain.
. . . and while they didn’t look too bad . . . They were best served like this . . .
. . . directly into the trash can. 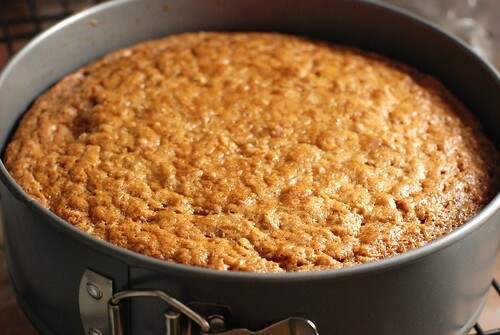 This cake was way too sweet, never ever (ever) finished cooking, was super dense, and lacked any kind of complexity to its flavour, even after I bastardized the recipe (swapping shortening for butter, more flour, maple syrup, etc etc). Yuck. After just a couple bites I suddenly wanted to eat nothing but vegetables for the rest of my life. 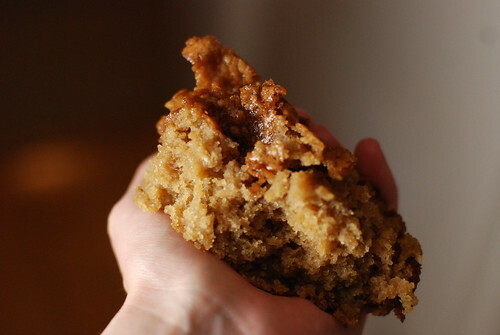 So apologies to the faithful who check up on Thursday mornings, I have no recipe to share today because this one is too awful and people might actually expect to be able to eat it afterward, which um, isn’t really a realistic option. I am, however, just putting the finishing touches on an article with a really bad working title like Omnomicon: Special Edition: how to buy spices. I would like to get that post up tomorrow with not only that how-to, but also a recipe to test out all your new spices. Why? Because I would hate to disappoint anyone. I . . . I love you man! Sad! 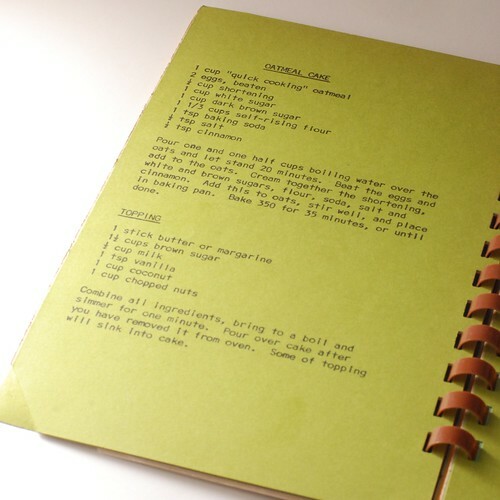 I kind of enjoy seeing “fail” recipes from time to time, though. It makes me feel better about my own foodie failures. 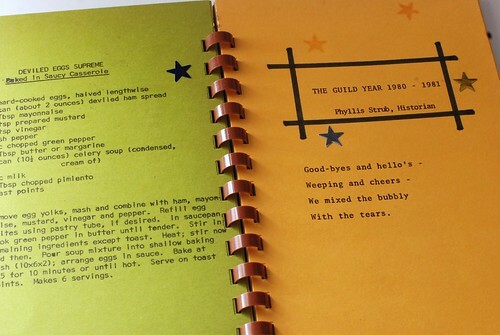 I agree with my friends above, tis good to see good & not.so.good recipes! The recipes are good but the pictures are my favorite anyways!!! All of the cookbooks I’ve seen like that one usually end up being a bunch of recipes from other, more well-known cookbooks. Or they end up being recipes like “Combine Sprite with Hawaiian Punch”. you know.. the fail recipe photo even looked great. haha! That makes me feel so much better about failbread. Spent grain is GREAT compost fodder! I can’t believe that it doesn’t taste amazing… It looks so good! At least the oatmeal looks really tasty, right? I love those old cookbooks! It gives you a glimpse into people’s lives, doesn’t it? The recipes are always an iffy thing though — you dont’ know if the submitter had tricks they didn’t even know they were doing. I found one cookbook that was all about Jello… mostly what could be put into it. Scar-y. Anyway, I found your blog while surfing for recipes. I’m really bummed about the spent grain cake. Think you’ll tweak it and try again?? You tried, and that’s huge in my book. I am not familiar with spent. Living in Los Angeles and don’t brew anything. 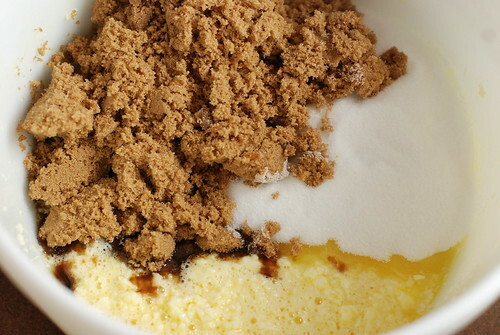 You never know with a recipe for baking if you experiment. I do it all the time, sometimes it works, actually usually it works. Once in a while though it fails. Years ago I made two quick breads for a friends party to add to dinner. One of them was lemon, oh, I winged both of these sans a recipe for either. Just my knowledge of baking. That lemon one took your face off in a tart way, in the trash at her house it went, never even hit the dinner buffet. The other one was pineapple/almond, good, but very dense, like you could use it as a brick to knock out a burgler. Tasted great but heavier than a boulder. Good idea as the fiber is so important and none of us eats enough of it, you tried to plump it up, good job. As much as I like your recipes, I must say that I really enjoy your style of writing as well. I assume it’s the way you’re thinking/the way you talk? 😉 Anyway, thanks for sparing us, and I’m glad you had a fail day. They happen to us all, right? 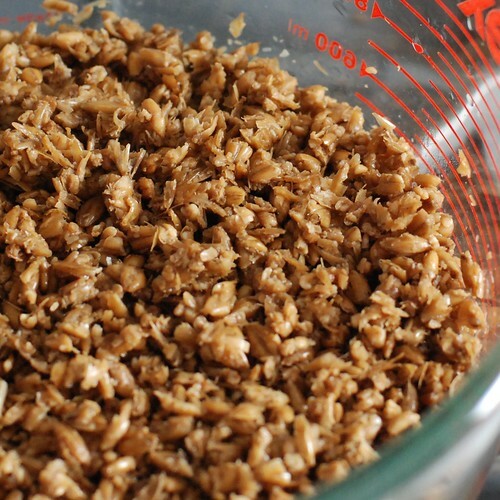 I’ve never heard of spent grain… and honestly don’t think I would have been brave enough to use it for anything!… kudos to you for giving it a shot… failed or not! :). I just found your site as a link to rainbow cake and I have to say… your pictures are awesome!! and your blog… really!! I haven’t laughed so hard in ages! LOVE your writing style… great sense of humor! I’ll defintely be checking back often :).